With FluidFuture® we optimise your system’s energy management in four steps. For maximum energy efficiency we always look at the hydraulic system as a whole and its entire life cycle. Our combination of expertise, experience with energy efficiency optimisation, and future-oriented products and services result in a maximum of savings. These are the four steps we take to optimise your system’s energy efficiency. Our systematic and targeted approach ensures maximum energy savings for industrial plants and other hydraulic systems. Benefit from this fast and economical optimisation in four steps: maximum energy efficiency at minimum costs. Based on rapid potential identification and detailed measurements we record the load profile, offer maximum transparency and detect saving potentials. We define the system structure and select matching high-efficiency pumps and components. We provide expert installation and professional commissioning. Intelligent pump technology and continuous monitoring ensure savings also in the long term. Not only our high-efficiency pumps but all KSB products are developed with energy efficiency in mind. For a maximum in energy savings, all components of a system need to be perfectly matched to each other. Our comprehensive optimisation spans the hydraulic system, drive, automation product and piping dimensions and can save up to 60 %. Have a look at some real-life examples. By saving energy and operating costs with FluidFuture®, you contribute to an efficient, resource-conserving future. Mega trends such as a growing world population, climate change and dwindling resources are major challenges for us and the generations to come. One of the key strategies for the future is saving energy. Pumps play a big part: They offer a particularly large potential for making industry more energy-efficient. 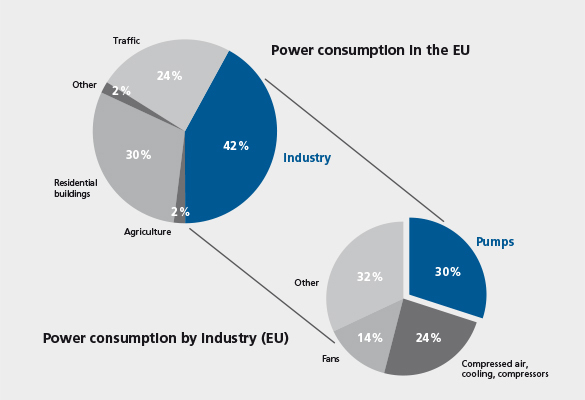 In the EU, a total of 300 terrawatt hours per year are consumed by industrial pumps, most of which are water, heating and process pumps. Thank you for taking an interest in FluidFuture® by KSB. Would you like to find out more? Contact us: it's quick and easy. Be the first to receive the latest news with regular updates on KSB and its key products. Sign up now: it's quick, easy, and free.